Returning to a devastated sponge, would the generational ships aid the remnants of a mutated pudding – or seek their future with Golden Syrup? Is that a gun? Or is he ready to do some serious power washing. That is so 1950’s…wait, this was published in 1991?? It’s heartening to see that in the future we’ll be repurposing 747 fuselages for our generational ships; it’s just such a classic style. I’m concerned, however, about the planned lack of landing gear and forward windows for our shuttlecraft; that seems like a recipe for an awful lot of incidental damage costs per unit per use, in my opinion. 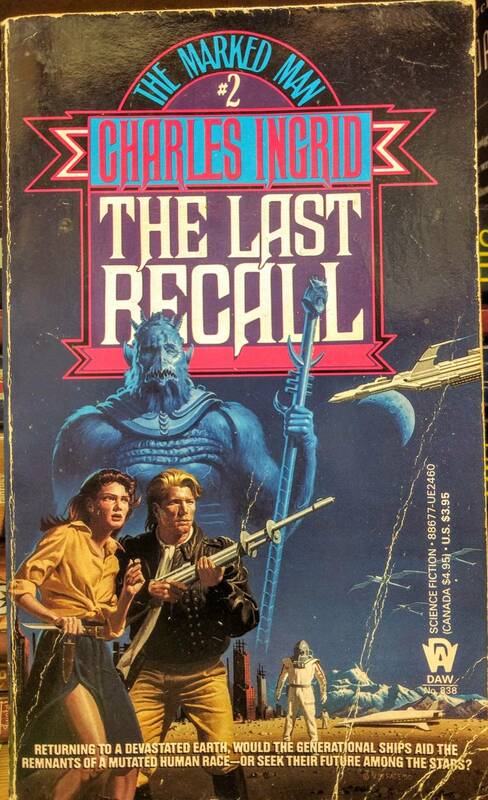 So now they have total recall? They have long range and close combat covered but mid range seems lacking. Throwing rocks seems their only option. Why are Generation Ships returning to a devastated Earth? Nobody aboard has ever seen Earth and the whole point is that it’s a one-way journey. Did they misprogramme their satnav? Did someone suddenly think ‘Oh Christ, I’ve left the iron on’? So who are the chickendevilgorillas? Mutants? Aliens not considered worth mentioning in the blurb? Tat [email protected]: indeed. Weren’t they supposed to have _already_ seeked their destiny in the stars? If they’re coming back, it would seem to imply they found it and didn’t like it. Jebus, that’s wordy. You can barely see babe, Biggles, and the blue chicken guy for all the giant title/series/author thingy, then the long blurb and the DAW logo with description and price. Is he Charles and she’s Ingrid? I bet they are. That’s their names emblazoned above them. Charles Biggles is the Marked Man, I guess. Who and why are the guys in space suits? And the airplane shuttles? If it’s that dangerous, why’s Ingrid got her skirt slit up to there and Charles has that scarf that’ll get him strangled? And why does she only have a kitchen knife (pointed the wrong direction)? @Tat and Bruce: Exactly! The blurb makes no damn sense. I guess they need to seek their destiny in a different direction. And reprogram the satnav. Maybe the last recall should have been on the satnav? What’s that title? “”The Last Bacall”? Is this a movie star retrospective? That is the saddest space chicken I’ve ever seen. @ARY: He is very blue. The two halves of his face seem to be drawn from different perspectives. Either that or he’s one of the mutants.